Hattie Mae screwed up. 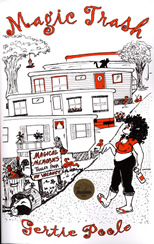 Along with her dysfunctional magical neighbors she is banished from the Magic Realm and forced to survive in a penal colony – Magic Memories Trailer Park in Florida. Even though they’re forbidden to use the trace magic left to them, Hattie finds she’s become an aging, fat, miserable elf. She can’t resist and the results are disastrous. Her indiscretions cost her a fortune in fines and years added to her sentence. Residual magic has side effects. To make matters worse, someone is murdering the residents. Argon, the king’s champion griffin is dispatched to investigate and eliminate the murderer. Invoking an antiquated law of the Realm to save a friend, Hattie now has one week to produce the murderer or forfeit her life. With the help of fastidious elf, an emotional troll, a foul mouthed parrot, a berserk toilet, and the pompous griffin with whom she shares a secret past, Hattie blazes forward to save lives, especially her own. This entry was posted in Books, Budget Books, Fiction, Sci-Fi, Young Adult and tagged Gertie Poole on April 8, 2013 by webmaster.